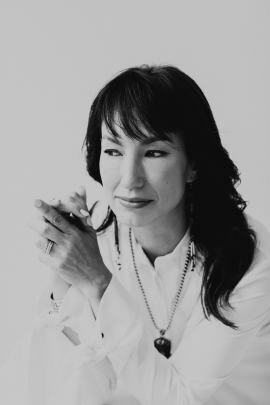 Marie was born and raised in California to a Japanese mother and American father, and graduated from Columbia University with a degree in East Asian Languages and Civilizations. Her memoir, Where the Dead Pause and the Japanese Say Goodbye, explores how the Japanese cope with grief and tragedy and is set against the backdrop of the 2011 earthquake, tsunami and nuclear disaster in Tōhoku, Japan and her family’s 350 year old Buddhist temple. The memoir was a New York Times Editors Choice, a Barnes and Noble Discover Pick, an Indie Next Pick, a Finalist for the 2016 Pen Open Book Award, a San Francisco Chronicle Best Book of 2015 and a Finalist for the Indies Choice Best Book for Adult Nonfiction for 2016. Her first novel, there Picking Bones from Ash, was shortlisted for the Saroyan International Prize for Writing, and a finalist for the Paterson Prize. Her essay, Letter from a Japanese Crematorium, was anthologized in Norton’s Best Creative Nonfiction 3. She has written for The New York Times, Salon, National Geographic, Glamour, and other publications and has been a guest on The World, Talk of the Nation and All Things Considered on NPR. She enjoys speaking to the public about Japan, modern attitudes toward religion and spirituality and seeing through unconscious bias. In 2013, Marie was awarded a Fellowship by the NEA and Japan US Friendship Commission, which enabled her to live in Japan. While there, she was featured in the NHK (Japanese National Broadcasting) Documentary, Venerating the Departed, which was broadcast internationally several times. Marie has also been award scholarships by the Bread Loaf Writers Conference and the Napa Valley Writers Conference, and has been nominated for the Pushcart Prize. Marie teaches fiction and nonfiction at the Rainier Writing Workshop, in Tacoma, Washington. She lives in San Francisco with her husband and son.